I don’t know about you. But, I always know it’s officially summer time when the bus stops driving by my house at 2:26 PM each day and the neighbor kids are out in full force riding bikes and having nerf wars. While summers in the south can be miserably warm, I still love sitting on the porch with a large iced coffee in hand to get outdoors. Not to mention, Beaux can’t get enough of sitting on the bench on our front porch watching #allthethings. In order to encourage front porch sitting this summer, I decided to make our little front porch a cozy spot for reading, blogging, or just watching the grass grow. If you’re talking about the dream, it’s a large wrap around farmhouse front porch that overlooks some land, my dogs, and maybe even some cows. 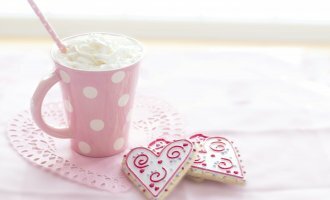 In fact, one of my favorite things that I would do when visiting my parents at their Texas ranch was sitting with them on the front porch drinking coffee each morning. There’s just nothing that compares. 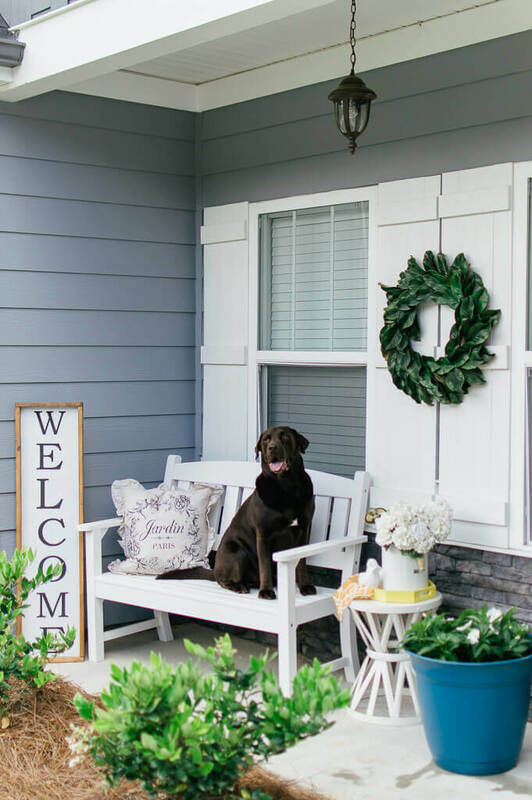 While our current front porch isn’t necessarily fitting of that description, I’ve been determined to make it a cozy spot that makes our entire home look warm and inviting. (Sounds fitting for A Hosting Home, right?) 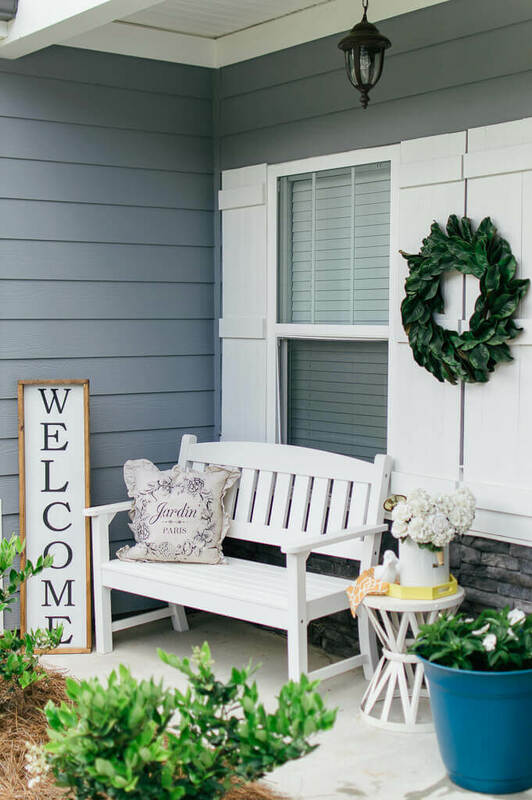 With your front porch being the first thing someone sees when they approach your home, I’m a firm believer that it’s definitely a spot that shouldn’t be overlooked when decorating. What feeling do you want to give your guests as they walk to your front door? 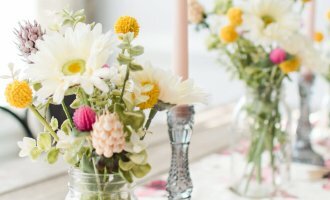 Although there’s so much more that we’re still wanting to do with both our front and back porches (like take out that awful pine-straw, plant some flowers, and do more landscaping! ), we’re so excited for our first summer in our new home. 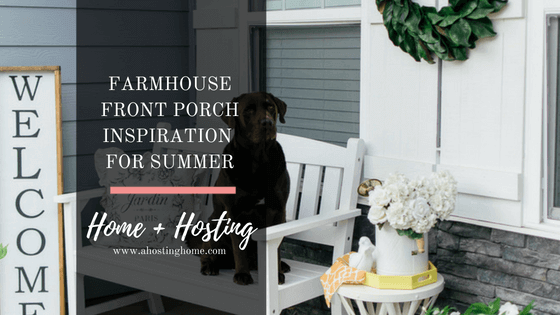 I can’t wait to show you all how we’ve embraced the summertime farmhouse vibes with some simple yet darling front porch additions in today’s blog post. Now if only it will stop raining here in Georgia long enough to enjoy it! 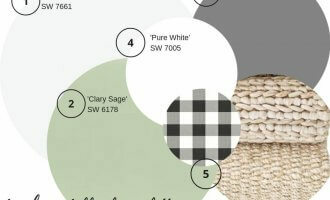 The first step to creating any cozy outdoor porch is the seating itself. When it comes to styling spaces, I always start with my large base pieces first and then add in the accessories. Our bench was actually our housewarming gift from my grandparents, and they got it from Hayneedle. (I even was able to put it together myself!) 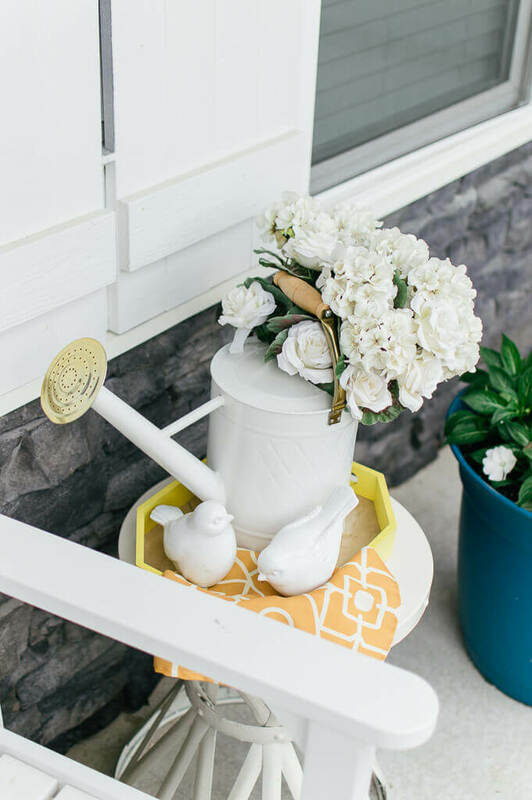 We paired it with a more modern and fun round side table from Home Depot and then topped it with some cute accessories to bring out all the spring and summer vibes. Meanwhile, I feel like the rustic welcome sign and french country inspired pillow from Homegoods gave the space the perfect cozy and welcoming touch it needed. 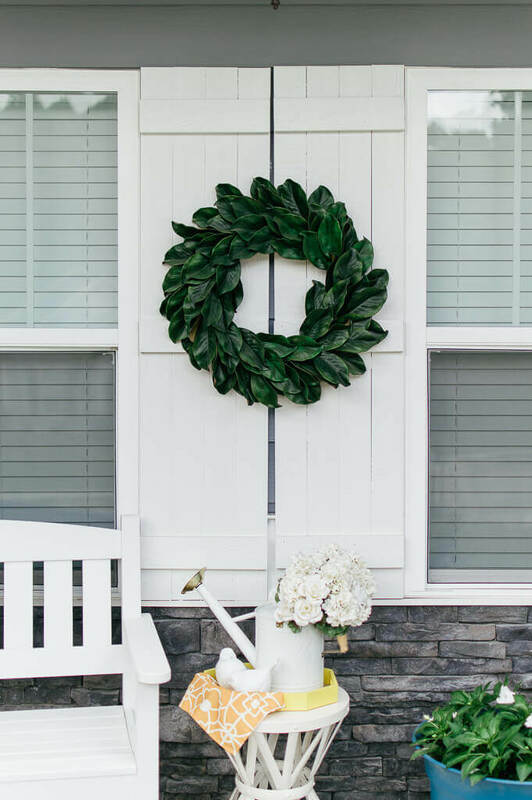 To brighten up and bring some contrast into the gray and white space, I also wanted to experiment with taking my DIY magnolia wreath from my front door to the shutters. Needless to say, I completely fell in love! I’m already planning my next trip to Hobby Lobby to make another one so it can stay. 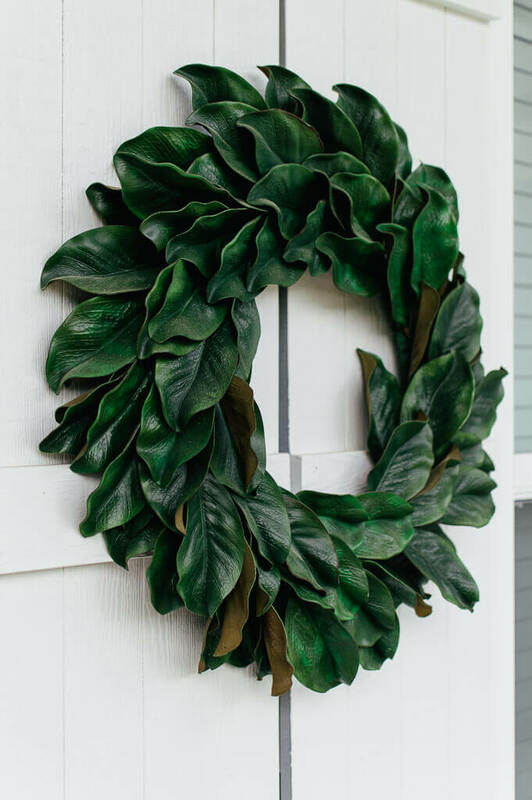 (It’s already got me dreaming of decorating with wreaths at Christmas time too!) You can read more on how to make your own DIY Magnolia Wreath, here. 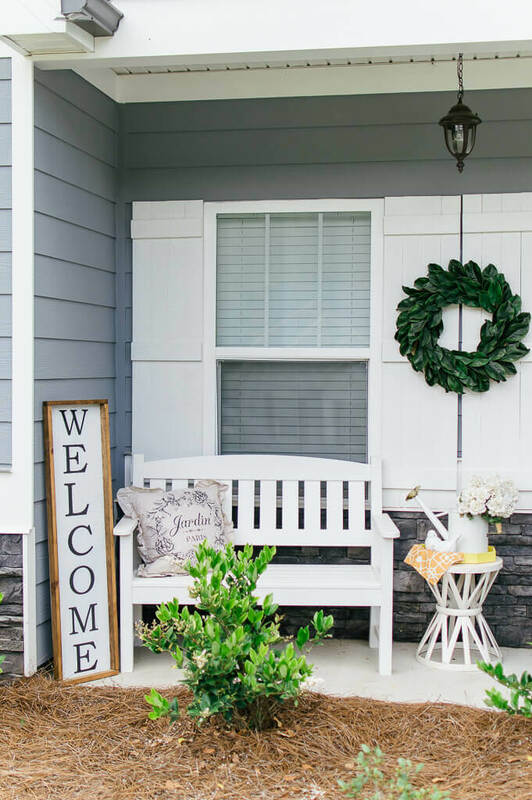 I hope you enjoy our cozy little farmhouse front porch as much as I do! 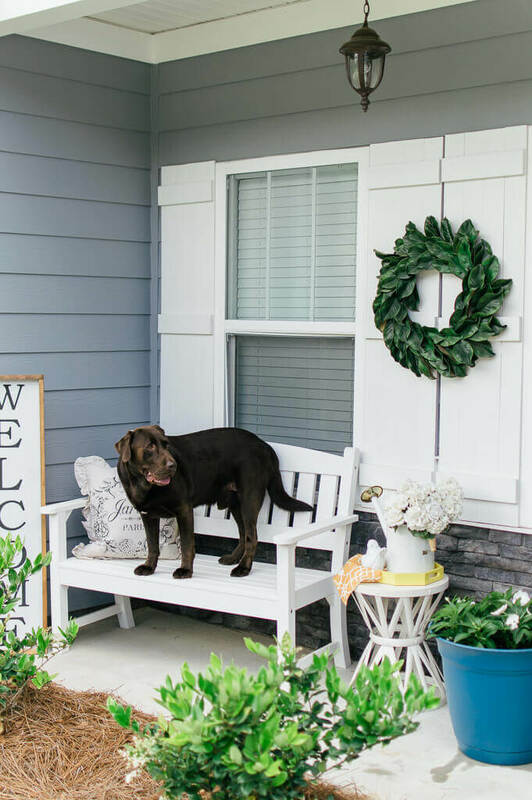 Not only does dressing up your front porch add some major curb appeal, but it’s also a great way to create a cozy place for you to enjoy the summer sunshine while watching your babies (fur or human!) play in the yard. Grab an iced coffee or a cold glass of sweet tea, and you’ve got the perfect summer ahead! 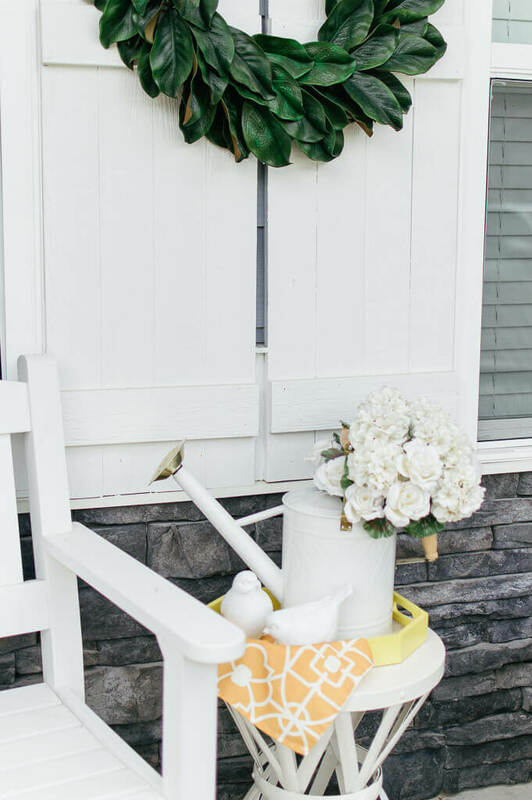 How do you plan on making your front porch an oasis this summer? Leave a comment below! All of the white is so fresh; and the little accent colors are “summer!” The dog makes it real! 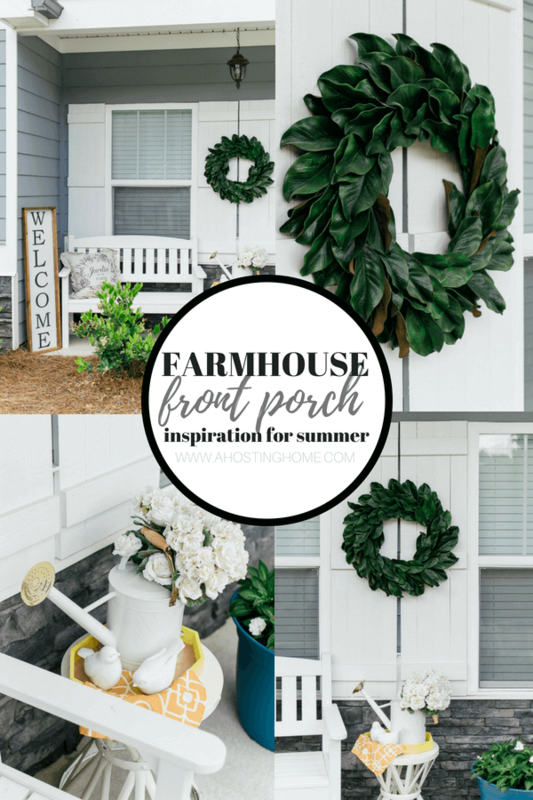 I love this farmhouse look for the front porch. the wreath is especially pretty. 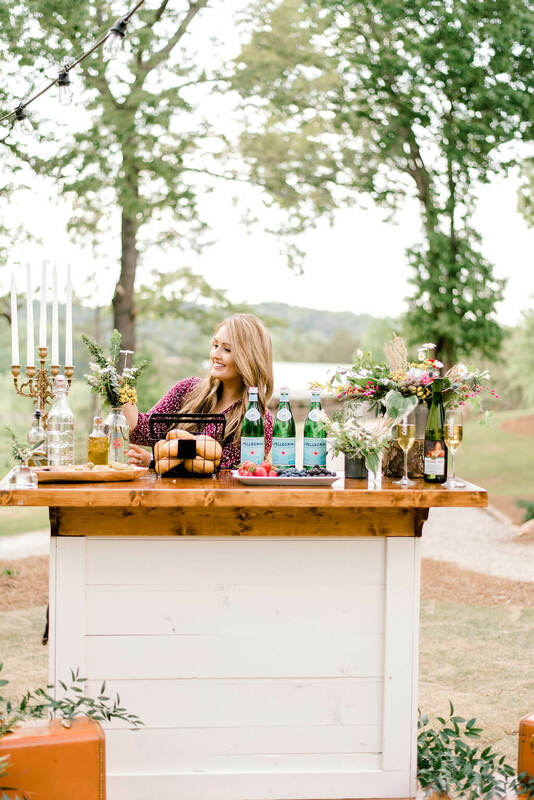 I love the farmhouse look! 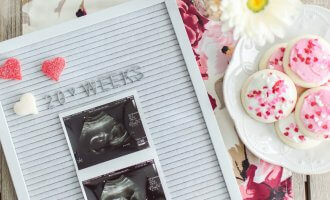 That flower pot decor is the cutest. That wreath is beautiful! So perfect. Im dying over that welcome sign! Gorgeous!! Love this! Makes me want to go out and buy everything! I absolutely love it all! 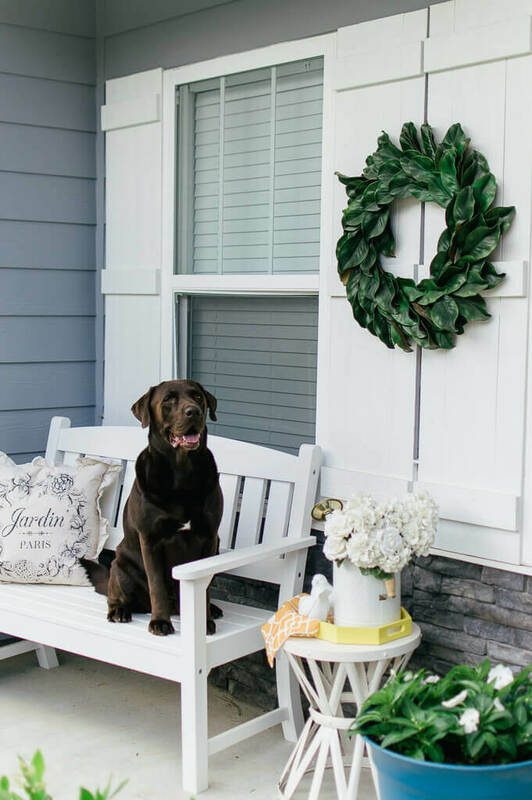 Extra love the sweet pup and that fabulous wreath though! 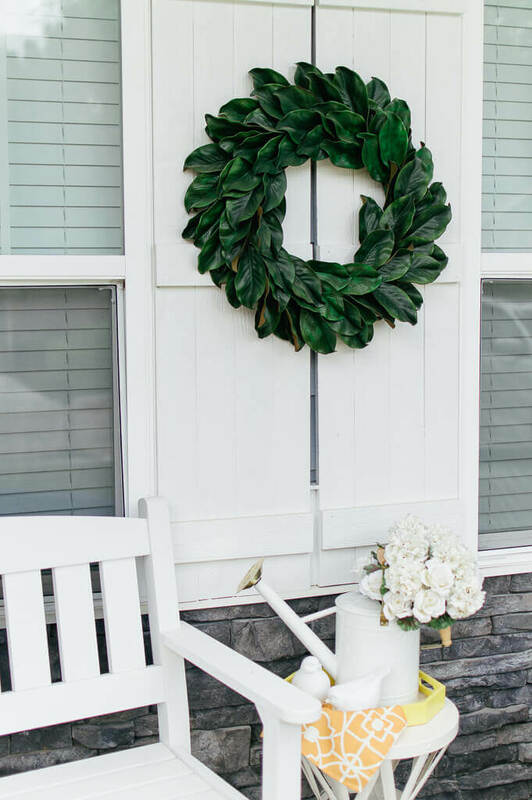 I love that magnolia wreath! I adore your decor for your front porch. my husband and i have been in our new house for a little over a year. that’s something we need to decorate! !